The Battle of the Westport took place over a three day period in October 1864. It all started on October 21, about 6 miles northeast of Independence, Missouri, on the Little Blue River. There around 8:00 a.m. on a cold Friday morning, a division of Confederate cavalry attacked a regiment of Federal volunteers defending a covered bridge across the Little Blue River. The fighting continued until midafternoon on Sunday, October 23, on the prairie south of Westport. Due to the number of soldiers involved, the Battle of Westport went down in history as the largest battle west of the Mississippi River during the American Civil War. The night before October 23, Maj. Gen. Sterling Price described his plan to his lieutenants, Maj. Gen. James F. Fagan, Maj. Gen. John S. Marmaduke, and Brig. Gen. Jo Shelby. The Confed-erate wagon train was in danger from the Union forces in West-port and those in Independence. So with the wagon train lumbering south through the night, Price ordered Jo Shelby to attack the Federal army in Westport in the morning. To hold off the Federals now in Independence, Price ordered Marmaduke’s Division to man the defenses at Byram’s Ford and hold off Pleasonton while the wagon train moved away to safety. Price was not the only commander making adjustments to their plans for Sunday morning. 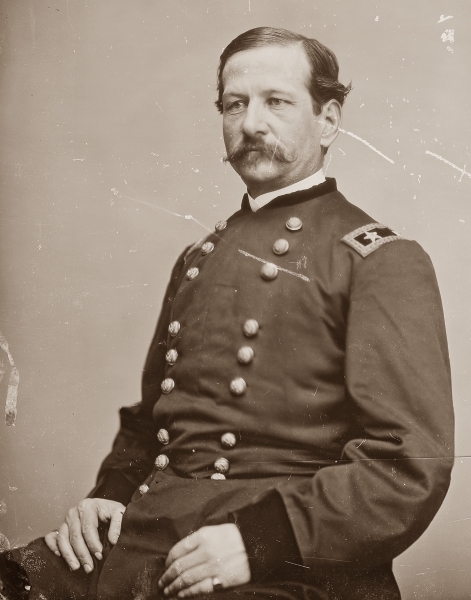 At first Maj. Gen. Samuel R. Curtis planned on staying within his Kansas City entrenchments. But late Saturday, he received a dispatch. Maj. Gen. Alfred Pleasonton was in Independence with 6,000 cavalry and was going to attack at Byram’s Ford on the Big Blue River first thing in the morning. General Curtis quickly decided to support that attack. 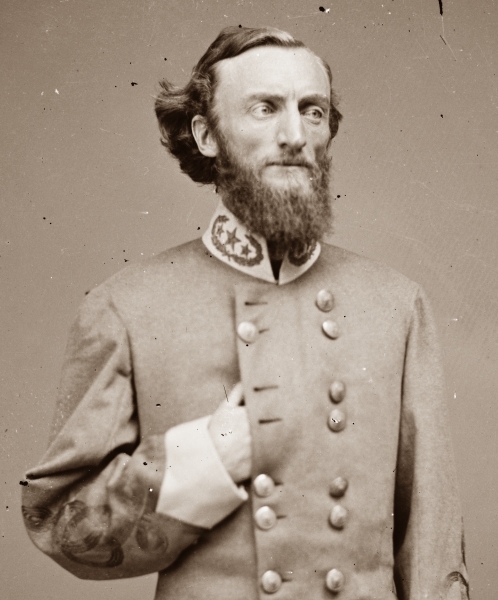 He ordered Maj. Gen. James G. Blunt to get ready to cross Brush Creek and attack the Confederates at daylight. And so it happened that two generals, John S. Marmaduke and Alfred Pleasonton, faced each other at Byram's Ford on the Big Blue River in Kansas City, Missouri on Sunday, October 23, 1864. Maj. Gen. John S. Marmaduke (Library of Congress). Maj. Gen. Alfred Pleasonton (National Archives).